My year has started on a high note! 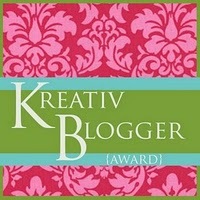 Thanks to Francina at Seasons Poetry for nominating my site for the Kreativ Blogger Award! Last summer when I changed the format of this blog, I didn’t think I would have many readers let alone receive awards – because who reads poetry? Well, it turns out that there are a lot of poetry readers and lovers out there and some of them enjoy my work. 1. The African violet I received for my birthday a few years ago is still alive – just barely. 2. I sometimes read the dictionary because the etymology of words fascinates me. 3. I went for a walk in the park one night while it was snowing and it was one of the most magical experiences of my life. 4. I wish I had taken ballet classes when I was a child. 5. I might have undiagnosed OCD. 6. I consider my friends members of my family. 7. I’ve kept just about every piece of poetry I’ve written since I was 15. 8. I love playing Scrabble – it might actually be an addiction. 9. The only constellation I can identify is the Big Dipper. 10. I am a romantic, although not always hopeless. I wish the best for everyone in the year ahead. Congratulations, dear one! Yes, walks at night in the snow are total magic! I WISH I had kept all of my youthful poetry scribbles! I love number two (re: etymology of words). Very fitting!